These all-natural, gluten-free, low-carb bread and tortilla alternatives highlight all the health benefits from coconut water, coconut meat, and extra virgin coconut oil. Eating healthy may seem tough a lot of the time, but there are a lot of ways you can still have a guilt-free snack. 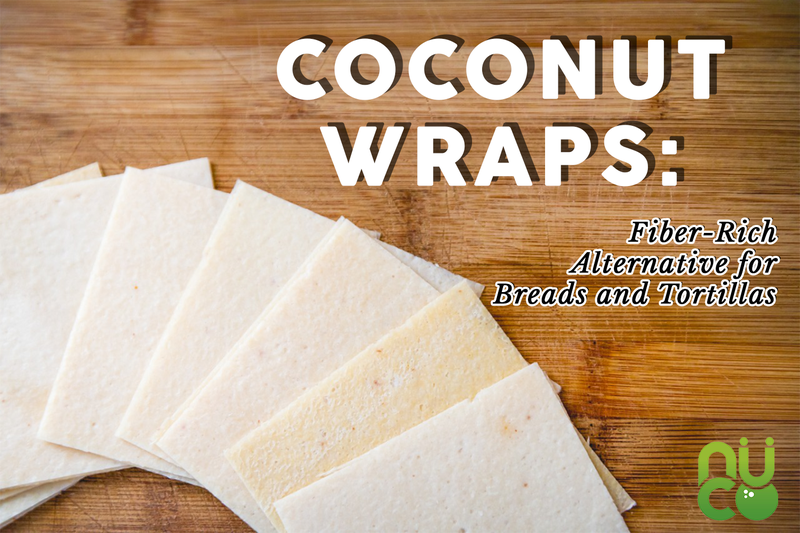 Luckily, coconut wraps are making their way to the market to be your next go-to healthy option for bread and tortilla. Made entirely from 100% organic coconut, these non-GMO, organic, raw wraps are great for people who are on a diet – whether it is vegan, vegetarian, paleo, or keto. In addition to that, coconut wraps are also highly recommended for those who have a food allergy or sensitivity. Perfect for sandwiches, tacos, and deserts, the coconut flavor also mixes in smoothly with any other fillings from avocado to peanut butter jams. Because of the tight texture of coconut meat, these healthy wraps don’t split in an instant when you roll and fold them which makes them ideal as a bread substitute. What Are Coconut Wraps Made Of? Coconut wraps are made from coconut water, coconut meat, and extra virgin coconut oil. These all-natural, organic ingredients make coconut wraps free from gluten, corn, soy, dairy, and egg. Moreover, some coconut wraps do not contain sugar or salt, which makes them a delicious fit for any lifestyle diet. Every ingredient of the coconut wrap comes packed with beneficial nutrients. Various studies show that coconut is packed with nutrients and minerals that protect your heart, boost your immune systems, and burn calories, among others. Naturally free of fat and cholesterol, coconut water has more potassium than four bananas and is a very hydrating drink. This drink is dubbed as “Mother Nature’s sports drink” by many in the marketing industry, and the demand for it is skyrocketing. Many athletes and celebrities endorse it through commercials with promises of hydrating your body and helping with many conditions, including hangovers, cancer, and kidney stones. The drink contains easily digested carbohydrates in the form of sugar and electrolytes. Coconut water is a clear liquid that can be found in the center of the fruit that is young and green about the size of a basketball. Young coconuts that are harvested at five to seven months of age contain mostly water. You can enjoy the greatest nutritional health benefits of coconut water by drinking the water of the young coconut since mature coconut milk is generally low in nutrients. The primary nutrient that coconut water has is potassium. It has approximately 600 milligrams that make it a high-electrolyte beverage. It also has a small amount of sodium of about 400 milligrams and has up to 10 percent of both calcium and magnesium we need. It contains fewer calories, less sodium, and more potassium than any sports drink. The most unflavored coconut water contains 5.45 calories, 1.3 grams of sugar, 61 milligrams of potassium, and 5.45 milligrams of sodium. It has less sugar than a sports drink and much less than sodas and other fruit juices. However, too much of it is not good either, since an 11-ounce container of it has 60 calories than can add up quickly when you drink several of them in a day. It boosts immunity. Free radicals are molecules that are produced in your cells during metabolism. The more we become stressed, the more free radicals are produced as a response to any stress or injury. Once free radicals overgrow in your body, it enters a state of oxidative stress that can potentially damage the cells and increase your risk of catching other diseases. Research on animals has shown that coconut water contains antioxidants that can modify free radicals so they can no longer cause you harm. It supports heart health. Drinking coconut water is believed to reduce the risk of heart disease. In one study, conducted with rats, the rats that consumed coconut water had a significant reduction in blood cholesterol and triglycerides. The same rats also experienced a decrease in liver fat. It lowers blood pressure. Coconut water is great in controlling blood pressure. In one study in people with high blood pressure, the water improved systolic blood pressure in 71% of participants. The potassium was shown to lower blood pressure in people with high or normal blood pressure. Moreover, a study on animals found out that the water contains antithrombotic activity that may prevent the formation of blood clots. The researchers also studied the high potassium content of the coconut water that led them to investigate the potential benefits for reducing cardiovascular risk. The potassium has the ability to counteract the effect of sodium in the body which helps in lowering blood pressure. It hydrates the body. The coconut water is slightly sweet with a subtle nut flavor. It is fairly low in calories and carbs. Since the coconut is rich in potassium and is known as an electrolyte replacement, it’s been used for IV hydration in some emergency situations. Compared to other sports drink, it is low in carbohydrates with only 4.5% of it, while other sports drink contain 6 to 8 percent of carbohydrate concentration. This makes it great for athletes who monitor their sugar intake and hydrate after an event. Moreover, it is great low-sugar hydration after a workout for casual exercisers. A study published in 2012 compared water, coconut water, and standard sports drinks to determine which among the beverages was best for post-exercise hydration. The researchers found out that there was no difference when it comes to sodium levels, urine output, or fluid balance between the beverages, which means that all three were hydrating. However, significantly less nausea or fullness was experienced with the coconut water that allows the subjects to drink more of the beverage. Keep in mind that coconut water is the best alternative to sports drinks, but it depends on the type of sports you try and the intensity of the workout. For long-distance endurance athletes, a more specialized product is needed to be composed of sodium and carbohydrates, but coconut water is a great substitute for casual exercisers. Coconut meat is the rich white lining that is contained within the shell of a coconut. This can either be juicy and tender or slightly thick and crunchy. Though coconuts only grow in tropical regions, they are still widely available in the American consumer market. A cup of raw coconut flesh contains 283 calories, and most of it comes from 26.8 grams of fat. Compared to other plant foods, coconut meat contains a large amount of saturated fat with 23.8 grams of it per cup. However, unlike other saturated fats which are long-chain fatty acids, most fat that can be found in coconut is a medium-chain fatty acid. MCFAs are broken down much faster than long-chain fatty acids, so they can’t contribute to high cholesterol as much. Coconut meat is very versatile since it can be eaten raw, cooked, or preserved. Add it to salads by topping them with shredded or grated and lightly toasted coconut meat. One of the many benefits of coconut meat is fiber content. A cup of it contains 7.2 grams of fiber which is more than 20% of the recommended daily amount for most adults. The fiber can assist the digestion process by adding bulk to the stool that can help move food through the digestive tract. It can also make you feel full, which is very important for those who try to eat less to lose weight. Another trace mineral content of coconut meat is manganese. A cup of it can provide 67 percent of the recommended daily amount for women and 52% for men. Manganese can help you metabolize both fat and protein easily. This also supports both immune and nervous systems as well as promote stable blood sugar levels. The manganese also helps the body to use other nutrients like iron, thiamine, and vitamin E.
The MCTS content of coconut meat can be converted into ketone bodies which can be a potential replacement energy substrate for the brain. The brain makes use of the glucose as an energy source. MCTS from coconut products like coconut meat may help increase the body’s ketone levels, which offer a dietary therapy approach in alleviating the symptoms of and can possibly prevent the onset of neurological diseases. Coconut meat appears to protect the body against heart disease and stroke as well. The meat has significant volumes of vitamins A and E, and polyphenols and phytosterols that work together to decrease the level of LDL cholesterol. Those are the fats that stay in the blood and skin tissues, and high levels of them have been found to be a risk factor for cardiovascular disease. The protective properties of coconut meat are perhaps the main reason behind why Kitavans of Papua New Guinea and the Tokelaus of New Zealand, where the staple food is coconut, have no incidences of stroke and heart disease in their respective populations. In spite of the fact that it is made up of 90% saturated fat, extra virgin coconut oil (EVCO) contains medium-chain fatty acids, also called as MCFAs, that can improve health. It is one of the smartest choices you can add to your diet. Using coconut oil in cooking is a great start in improving your health since it can withstand high temperatures without heat damage. MCFAs in coconut oil can also be digested easily and can immediately convert into energy rather than being stored in the body as fat. Moreover, these fats can help boost the metabolism which is a great way to lose weight. Since it is considered as a functional food, it is recognized by the medical community as a powerful tool against any immune-related diseases. It is nutritious and contains lauric acid that is known to be the superior disease-fighting fatty acid. In addition, it contains a lot of fiber, vitamins, and minerals. EVCO will assure you the quality of the product that is unrefined, certified organic by USDA standards, and do not contain any added chemicals or genetically modified additives. The product is also made only from fresh coconuts and is a solid at room temperature. Among Asian and tropical countries, the Philippines are known to be the world’s largest exporter of organic coconut oil. Since EVCO is not subjected to any heat or sunlight and is extracted from fresh coconuts that undergo a different process of extraction, it is certainly richer in health benefits than ordinary coconut oil. It has a higher vitamin content, and it contains more antioxidants, minerals, MFCAs, fragrance, and even protein. The shelf life of it way longer than other edible oils. Due to the fact that it has higher amounts of lauric and capric acid, the prospect of using it as a complementary treatment for AIDS is also being considered and explored. Since it produces ketones when digested, it is possibly useful in fighting cancer. Also, tumor cells cannot access the energy stored in ketones and are glucose-dependent. It is also known in countering the side effects of many medications, especially the side effects of cancer treatments according to studies. Moreover, in a study conducted in 2004 and published in the Journal of Neurobiology of Aging, the researchers found out that the MCFAs in the oil can improve the memory problems of elderly subjects. Among the patients, those who took the oils showed a marked improvement in their ability to recall. Due to the fact that the body can easily absorb MCFAs, it can be accessed in the brain without using insulin. In addition, it fuels the brain cell more efficiently. Coconut wraps are all-natural alternatives to bread and tortillas wraps. They have a touch of sweetness to them. These wraps are even approved in many other diet types such as the paleo and keto diets. It is also an ideal replacement for sandwiches, crepes, tacos, burritos, or anything you want. It can go from anything from savory to sweet flavor due to the fact that it is very versatile when it comes to flavor. Take note of the fact that these wraps can burn quickly, so go low and slow when heating one. Since it is a ready-made product, you don’t need to refrigerate, freeze, or heat it, but doing it anyway has no real difference.